Why haven't I thought of this sooner? 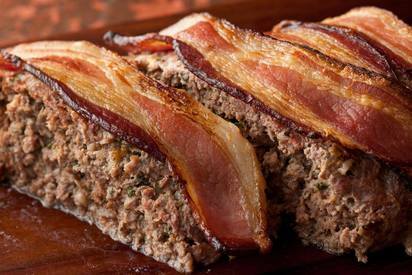 A bite of this meatloaf tastes like a Bacon cheeseburger without the bun. Ground beef is mixed with sharp cheddar, grated onion, garlic, and ketchup; formed into a loaf; and covered with Bacon slices. After it’s baked, a quick broil makes the Bacon on top extra crispy. The whole thing’s so easy you’ll have time to spare!